Pati Jinich. Photo by Michael Ventura. In the Mexico City of their youth, Pati Jinich and her three sisters were practically the only Jewish students in their private school classes—and probably the only one whose grandmother prepared guacamole with Jewish flair. “We always knew we were Jewish but we weren’t front and center about it,” Jinich (pronounced yee-nitch) said of her Judaism as we snacked on a selection of ceviche and other small plates at Caracol, a trendy Mexican restaurant in Houston. Jinich, 44, a petite, sharply dressed and highly energetic sparkplug, was in town for a cooking demonstration and book signing for Mexican Today: New and Rediscovered Recipes for Contemporary Kitchens , her second cookbook. We talked about her upbringing, filming the fifth season of her Emmy-nominated public television show, Pati’s Mexican Table, and what it’s like to be a Yiddishe mama Mexicana. Jinich’s parents raised their daughters with minimal connection to the formal Jewish community, eschewing religious school, Jewish girl scouts and membership at the Jewish community center for a focus on cultural integration and academic success. Then there were the High Holiday meals with her mother’s Austrian-Czech parents, refugees from World War II who reinvented themselves in Mexico as successful silversmiths. 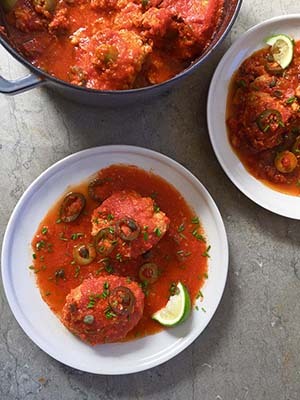 They favored elaborate French meals served on fine china and silver and, again, Mexican elements: Gefilte Fish a la Veracruzana, her maternal grandmother’s version of the Jewish staple, is smothered with tomato sauce and punctuated with salty olives. In 1996, at the age of 24, she married Dani Jinich, a fellow Mexican Jew, and the young couple soon moved to Dallas so her husband could pursue a career in finance while she earned a bachelor’s degree. All along, her interest in food grew; she became an intern on Texas chef Stephan Pyles’s public television show. The couple then moved to Washington, D.C., where Pati Jinich completed her master’s degree in Latin American studies from Georgetown University and started working at a prestigious think tank. But the call of a career in food was growing too strong to ignore. Soon, she enrolled in L’Academie de Cuisine in Maryland, began contributing to local publications and eventually caught the eye of the Mexican Cultural Institute of Washington, D.C., which invited her to host a series of high-profile dinners. To this day, she is their chef in residence. As she was developing her new career, Jinich simultaneously began exploring her Mexican-Jewish heritage. “Being away from the country made me miss it,” said Jinich, who read history books and scheduled long phone interviews with great-aunts and great-uncles in Mexico. She discovered a rich tradition dating back to the early 1500s, when three boats carrying Spanish crypto-Jews arrived in the southern port of Veracruz. After Mexico was secularized in the 1860s, President Porfirio Diaz wooed many progressive European Jews to relocate. Subsequent waves of Jewish immigration paralleled the end of the 19th century and the rise of Nazism as well as post-World War II, when an influx of Jews from Syria and Lebanon arrived. The current current Jewish population in Mexico is approximately 50,000. Each wave has contributed dishes to the Jewish-Mexican cooking canon. The first season of Pati’s Mexican Table aired in 2011 and included an episode that focused on the Sephardic and Lebanese influences on Mexican cooking. 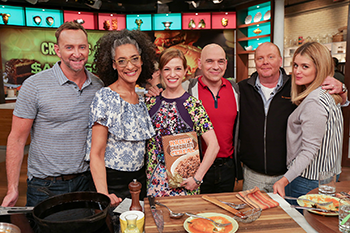 (You might also recognize Jinich from her frequent appearances on ABC’s The Chew, a popular food and lifestyle talk show.) The best-selling cookbook of the same name followed in 2012. Her latest book focuses on easy-to-prepare dishes that she serves her husband and three sons: Alan, 17; Sami, 14; and Julian, 10. 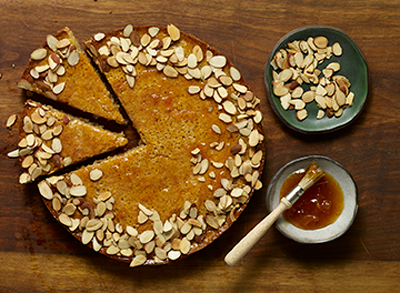 While Jinich’s gefilte fish recipe comes from her personal archives, the port-infused, apricot-glazed almond cake is from the new book as is this roasted asparagus recipe. 1. Make the patties: Rinse the fish under cold water; pat dry. Cut into chunks and pulse in a food processor until finely chopped but not pasty, 5 to 10 seconds. Transfer to a large bowl. 2. Place the onion, carrot, eggs, matzah meal, salt and white pepper into a processor bowl and process until smooth; add to fish and combine thoroughly. Chill until ready to use. 3. Make the red sauce: Heat the oil in a large pot over medium heat. Add the onion and cook until translucent, 5 to 6 minutes. Add the tomatoes, raise the heat to medium high, bring to a boil and cook until thickened, 6 to 7 minutes. Stir in the water, ketchup, salt and pepper, bring to a boil, reduce the heat and simmer while you form the patties. 4. Wetting and rewetting your hands as needed, form 16 equal-sized fish patties about 3 inches long by 2 inches wide and 1 inch high. Gently slide each patty into the simmering red sauce, raising the heat if necessary to maintain a steady simmer. Cook the patties, covered, for 25 minutes. 5. Remove the lid and gently stir in the olives, peppers and capers. Continue to simmer the patties, uncovered, for an additional 20 minutes until they are thoroughly cooked through and the red sauce has thickened. 6. Divide the 16 patties and red sauce among plates or shallow bowls, garnish with chives and serve with lime wedges. Photo courtesy of Pati Jinich. 1. Preheat the oven to 425 degrees. Trim away the dry hard ends of the asparagus (about 1 inch from the bottom). Using a vegetable peeler, peel each asparagus stalk, beginning 1 1/2 to 2 inches below the tips and peeling all the way down to the bottom. 2. In a large bowl, combine the basil, mint and sage with 1/4 cup of the olive oil, 1 1/2 teaspoons salt, pepper and shallots. Beat with a whisk or fork until combined. 3. Set a rimmed 18 x 13-inch baking sheet on the countertop. Add the cherry tomatoes to the marinade, toss well and, with a slotted spoon, arrange on half of the baking sheet. Place the asparagus on the other half. Pour the remaining marinade over the asparagus and toss until thoroughly coated. 4. Roast the vegetables for 12 to 13 minutes, until the asparagus is crisp yet tender. Remove the asparagus and set on a cutting board to cool. Return the tomatoes to the oven for another 5 to 6 minutes, until they have burst, deflated and begun to char. Remove from the oven and let cool. 5. Using a slotted spoon, gently transfer the tomatoes to a bowl. Pour all the juices from the baking sheet into a blender. 6. Once the asparagus has cooled, cut away 1 inch from the bottom of each stem and add the ends to the blender. Cut the rest of the asparagus into 1 1/2-inch pieces and set aside. Add the lime zest and juice to the blender, along with the remaining 2 tablespoons oil, the mustard, 1/2 teaspoon salt and the egg yolks. Purée until completely smooth. 7. Place the avocado chunks in a large serving bowl, pour on the vinaigrette and gently toss until the avocado is thoroughly coated. Arrange the asparagus on top. 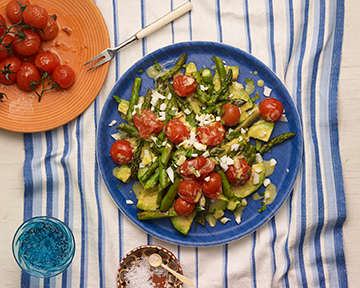 Spoon the roasted tomatoes over the asparagus, garnish with the chopped egg whites, and serve. 1. Butter a round 9- to 10-inch springform pan, and cover the bottom of the pan with parchment paper. Preheat the oven to 350°. 2. Place the almonds and sugar into a food processor. Pulse until finely ground. Crack the eggs on top of the mixture. Pulse until well combined. Mix in the vanilla extract and port. Drop in the butter in chunks and process until smooth and thoroughly combined. 3. Pour the batter into the pan. Place on a rack in the middle of the oven and bake for 30 minutes. The top will be nicely tanned, the cake will feel springy to the touch and a toothpick inserted in the cake should come out clean. 4. Remove cake from the oven and let cool for 10 to 15 minutes. Unmold the cake, invert onto a platter and remove the parchment paper. Invert the cake again onto another platter to have the top of the cake right side up. 5. In a small saucepan, mix the apricot marmalade or jam with the lime juice. Set over medium heat and simmer for a couple minutes. 6. With a brush, spread the apricot glaze on the outer circumference of the cake top, about 1 to 2 inches in depth. Sprinkle the glazed area with the toasted almonds. You may serve the cake with whipped cream on the side, or on the top of the cake. Recipes excerpted from ‘Mexican Today’ ©2016 by Pati Jinich. Reproduced by permission of Rux Martin Books/Houghton Mifflin Harcourt, all rights reserved. Our entire family loves you on Create. I love in Florida and my youngest daughter lives in Toronto. You are kind, generous, funny and a wonderful passionate cook as well as a loving wife and mother to your adorable sons. Hi Pati. I’ve been watching your shows lately. You are a breath of fresh air. You’re kind, sweet to everyone in your episodes. You have a beautiful family, husband and three gorgeous sons. I have two boys, all grown up, married and families. I love your style of cooking. You have a great sense of humor. Keep up the good work. Very impressive. I lived in Mexico for 18 years, arriving there at 17. I went to the American School in the early 70’s. At our reunion I asked my classmates if they knew your wonderful show and cookbook. One of them smiled and said you are her cousin! Your show takes me back to those years when as a young mother, I learned to cook from my friends and my mother in law. It was an art and so, so delicious. You allow me to relearn favorite recipes from your books and show. Thank you so much, Pati!!! Being one of only a handful of Mexican families in a small mill town, recently catching your show has been brilliant. After my grandpa’s passing, we lost seemed to loose sight of our heritage. Seeing the way you easily prepare the dishes has helped me to overcome my reluctance to cook with chilies, spices, and all the delicious ingredients that goes into these brilliant recipes. Thanks for helping me rediscover my heritage. Pati, I’m one of your devoted fans. I love Create and your show. I’m from California, so I’ve been exposed to Mexican food all my life and love it. The dishes you make are different then the usual fare I’m used to. I love your trips to Mexico. The colors, historic places, the different cultures of each region. But especially when you cook with some of the people and go to the plazas and gather and talk about the different foods. Your family is wonderful, and I love to see them on the show. All in all, I probably enjoy your cooking show better than any other on TV. Thanks for sharing your heritage with us. By the way, being Jewish, I’d love to see how your grandparents influenced some of their Jewish cuisine into your Mexican cuisine. I love them both. Take care, and thanks. My husband is of Mexican decent. I am Jewish and came here to California when I was 15 from New England.We enjoy watching your show, and I wanted to know more about you, and learned that your father’s family came from Poland, and your mother’s family came from another country. My backround is similar.My mother’s parents came from Poland, and my father’s family is from Russia. Many Mexican Jews came to Mexico due to World War Two. It is very interesting to us to hear about your backround. Many Jewish people went to Mexico because the United States didn’t let Jewish people into our country during that time so they settled in Mexico. It would be so interesting to sit down to talk with you. We think your boys are very nice and very smart too. We wish you and your husband the best of everything. My family and I love your show. We eespecially enjoy watching your travels throughout Mexico. Would it be possible to do a season of Mexican sweet bread baking . Do you know of any Mexican sweetbread cookbooks? Your show (on Create) is definitely one of my favorites! Cooking is one of my favorite things to do. Being of Mexican decent, I’ve learned so much from my own grandparents and aunts. Your boys are adorable, but I have to say, when Juju is there, it’s the best! Keep us inspired Pati!! Thank you! Pati I love your show! Your humor is contagious and I find myself in better spirits. I tried getting tickets when you were in Los Angeles recently. Sadly they were sold out. Hi Pati, my husband and I love your show. My husband is crazy about Mexican food. As an OB/gyn surgeon (now retired), and with his office next to Taco Bell, that was all he wanted for lunch – all the time! I am a Latina, so I can somehow satisfy that wish, but nothing like you ! However, I print some of your recipes to get familiar with them before “production day”. Your cooking is awesome! Blessings from Florida, Dr. Wayne S. and Victoria Blocker. text me back with your answer.